This page demonstrates the congruent arc modification of the Latarjet procedure (as developed by Joe DeBeer), which increases the joint surface contact area, enhancing the joint stability. It has the advantages of improving both the bony and soft tissue problems, with a strong fixation, allowing early active rehabilitation. A 5cm skin incision is made, starting at the tip of the coracoid process and extending inferiorly. The deltopectoral interval is located and the cephalic vein is identified. 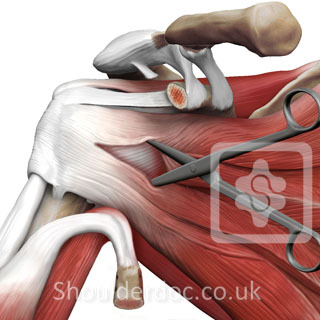 Deltoid and the cephalic vein are retracted laterally. 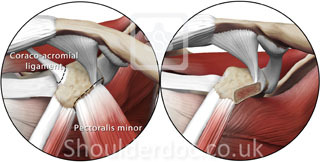 A self-retaining retractor is then placed between the pectoralis major and the deltoid, exposing the conjoined tendon and coracoid. 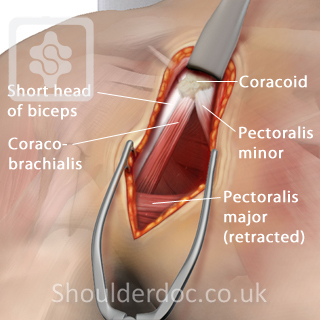 The pec minor is detached from the coracoid. 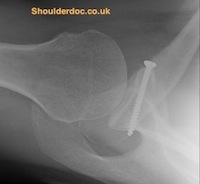 This can be done with/without a sliver of bone, to be fixed to the base of the transected coracoid later. 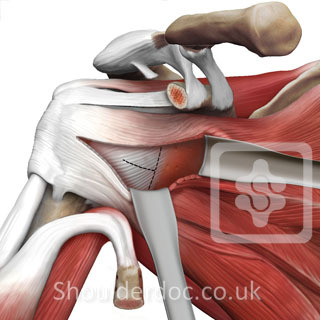 The coracoid is divided at it's base. 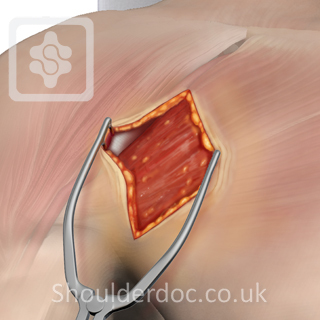 Subscapularis is split in line with its fibers. A medially based T capsulotomy is performed. The glenoid neck is exposed. 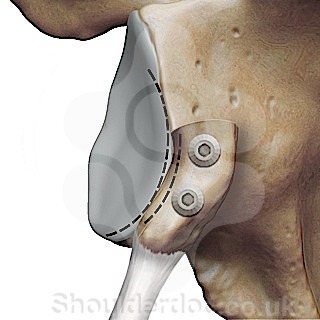 The coracoid is fixed to the anterior glenoid rim, flush with the articular cartilage. 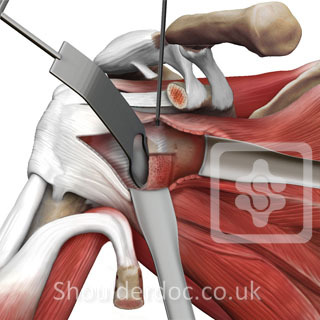 The coracoid graft increases the anterior glenoid articular surface, adding stability to the joint. 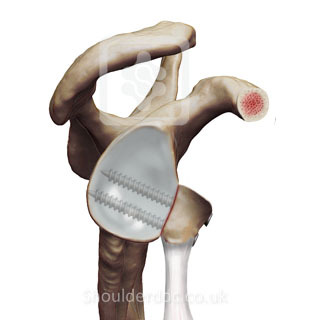 The 'congruent arc' effect is shown below due to the match of curvature of the undersurface of the coracoid with the curvature of the glenoid surface. 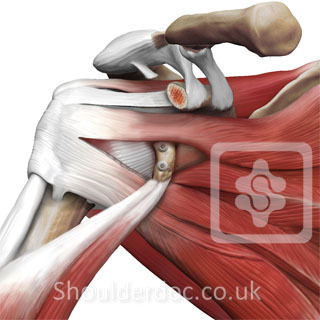 Stability is also enhanced by the overlap of the conjoined tendon with the lower half of subscapularis in in abduction and external rotation.